At By Goldenstar, designing and making custom garments is a process that is about so much more than picking a fabric and sewing a dress. This is a very special time for the children and their loved ones who comes with them. Arriving at my studio they seem to already sharing a feeling of mutual excitement and connection. Allowing the children to step into an adult space and encourage them in making key decisions sets a tone of importance for them. Seeing their ideas rendered into a real garment, one that is well made and substantial, is amazing. Amongst all different ages and personalities, I see that the children recognize that this is a unique experience and appreciate that their opinions matter. And it is a special experience for parents or grandparents to see their child interacting in this setting, often surprising everyone with true attention to detail, or a technical interest in the process, or picking a black and gold fabric over pink! I see a lot of hugs and smiling whispered tete a tete’s between the children and their loved ones. Slowing down to create together brings kids and grown ups closer, it is always a special time for all. Creating a custom garment usually involves two visits to my studio in Cumberland Foreside, Maine. The initial visit called the Custom Consultation and the second is called The Reveal Session. At the Custom Consultation, you and your child (or grandchild, niece, friend, etc) visit my studio for about an hour. I will show the child how the garments are made, allow them to try on samples I have in the studio and in general follow their lead on their interests. Then we will visit my magic closet of fabric and they can select their favorite fabric and we can discuss details about how the dress will look. Sometimes this means draping fabric, sometimes we sketch, it all depends on the child and the garment we are creating. Then I will design and make the garment around their selection. The Reveal Session is a really fun time! 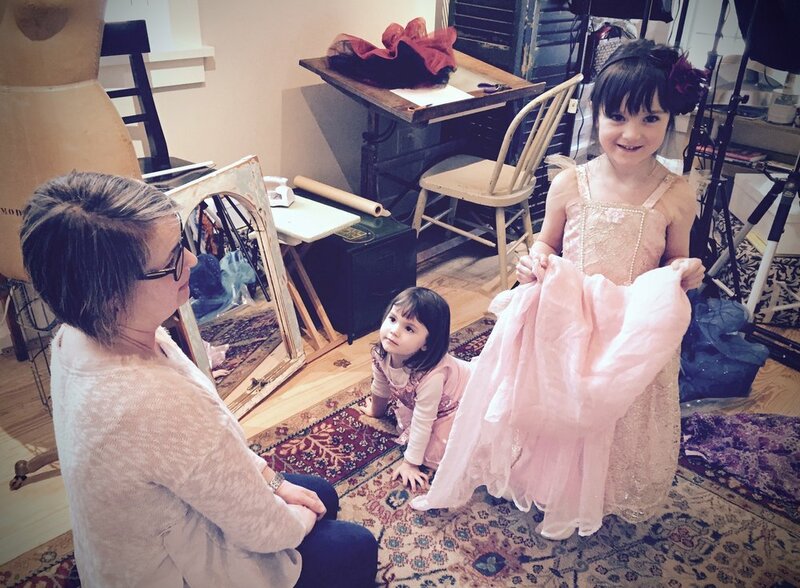 When you arrive at the studio I will have the dress set up in a special area hidden behind a screen which gets pulled back just for the child to see their creation for the first time. There is then time to try on, spin and admire to their heart's content. If desired, we can even have an informal photo shoot! All you have to do is ask! Just shoot me an email with what you are interested in and we can discuss you ideas and get the ball rolling! Once we have completed our Custom Consultation, design and construction takes anywhere from 2-4 weeks depending on the availability of materials, complexity of construction and my workload of other orders. I will give you a timeframe when we begin the conversation. If you have a specific date (i.e. a birthday or special holiday gift), please contact me no less than two months prior to the date to ensure timely completion. I don't live in Maine can I still do a custom order? Yes, there are several ways we can do this. We can work through email and phone, exchanging images and ideas. I can also mail swatches for those that want to touch/feel/see the fabrics. Also I have had good success with a "studio visit" via Skype or Facetime, these are fun for kids in particular so they can "see" where things are made. Please visit my the Custom Garments section of the Shop for an idea of pricing ranges by style. Price is driven by the materials used and the time spent in design and construction. Knowing your budget will help me to guide to a style and material selection that will meet your budget and delight your child! What should I do before the Custom Consultation? I encourage people to explore the photos on my website on their own or with their children to get an idea of the work that I do. Often a child will love one style in particular and we can use elements from it as a springboard for our own design session. It is important that you have an idea of budget in mind and let me know prior to the Custom Consultation. We can establish a game plan prior to bringing your child to the studio so I can help guide the conversation so they know what is in bounds and what is not.